HARRY BROWN is a gritty and realistic crime drama that re-visits the familiar territory of the DEATH WISH films. 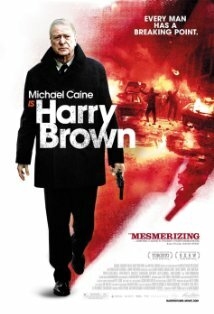 Michael Caine gives an engaging performance as Harry Brown, a British 70′s-something pensioner, besieged by a neighborhood of drug dealers, addicts and thugs. Recently widowed and all alone, save for one friend, we can’t help but sympathize with his plight. It’s when Harry’s best friend is mugged and brutally stabbed to death that he becomes a vigilante. In short order Harry is dispensing his own form of justice around his housing estate. Police woman D.I. Frampton suspects Harry’s motives, and quickly becomes a foil to his ‘Bronson’ personna. The role of the ‘maverick British police woman’ has been created many times before, most notably in the TV series BLUE MURDER and PRIME SUSPECT. In HARRY BROWN, Emily Mortimer gives a durable performance in a workmanlike role. As always, it’s a pleasure to see Michael Caine adding finesse and charm to an otherwise familar crime drama. HARRY BROWN is an enjoyable, yet gritty and violent film. In a time when Greek gods were as plentiful as nuts in a Snickers bar, you’d think that peace and tranquility would reign. Not true. The gods bicker amongst themselves like children vying for the attention of their parents. Zeus (Liam Neeson) is the head puppeteer in the gods’ plan to gain the undying love and attention of the mortals. Based on the theory that you never appreciate what you’ve got until it’s gone, Zeus hatches a plan to send carnage & devastation to the mortals. To carry out the plan, Zeus forms an alliance with his brother Hades (Ralph Fiennes). Creating a relationship with anyone from the Underworld has never been a good idea, and of course Hades has his own ajenda. Down on Earth, in the city of Argos, the mortals have complicated backstories. At times you may feel like you’re watching LOST without the helpful pop-ups. 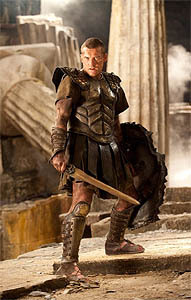 Perseus ( Sam Worthington ) is a demigod, born from Zeus’ dalliance with Danae, Perseus’ mortal mother. It’s good, it seems, to be a demigod, they have some of the powers of the gods, but enough love and compassion to keep them well grounded. Within short order, Hades overruns Argos with his loathsome bat-creatures and threatens release of the Kraken. Rumored and much feared, the Kraken was the nuclear bomb threat of it’s day. Perseus, it seems, is the only one with enough moxie and special powers to end the threat. In a quest that’s quite typical in Greek Mythology, Perseus is given a laundry list of tasks to carry out. Throughout this quest there’s no end to the battles that Perseus must endure so he can save Argos from destruction. It’s inevitable that the new CLASH OF THE TITANS would be compared to it’s 1981 counterpart. At that time no CGI existed and special effects were limited to the very skilled craftsmanship of Ray Harryhausen. Using stop motion techniques, the actions of highly detailed models were inserted into the live action film. The downside of this was that a two minute sequence could take several months to film, so action scenes were understandably limited. At times the 1981 film suffered from long “talkie” sequences while we waited for the next thrilling monster scene to arrive. However, with lots of exquisite CGI action, the new CLASH OF THE TITANS doesn’t dissapoint. Well crafted monster sequences are in abundance and will keep any horror film fan on the edge of his seat. Medusa, a gorgon, is portrayed in the 1981 version, as one of filmdom’s ugliest and most despicable characters. The gorgon, a highly detailed animation model, slowly slithered through the dark castle, hiding behind Greek columns, and picking out her victims one by one. In the 2010 film version, Supermodel Natalia Vodianova re-invents the gorgon as a lithe, alluring, yet horrifying monster. Her vapid yet mesmerizing stare is all that’s necessary to turn a man into stone. We’d worried that in the new film, given the gift of speed, the gorgon’s attacks would be just too fast to maintain a feeling of suspense. But those fears were abated when we saw the great editing, set design, eerie lighting and the wonderfully choreographed fight. The encounter with Medusa turns out to be one of the highlights of the new film! The giant scorpions, spawned from Calibos’ blood drippings, are much larger, and more fearsome than their incarnations in the 1981 film. Memorable moments include an extended battle that’s reminiscent of the giant bug fights in STARSHIP TROOPERS (1997). After much anticipation, we finally get to hear Zeus intone the now over used cliché “Release the Kraken!”. Ominously rising from the depths of the ocean, the Kraken is a behemoth to be reckoned with. Towering menacingly above the city of Argos, the Kraken lashes it’s multiple tentacles and destroys buildings in a way that would impress even Godzilla. In the 1981 film, Perseus fought the Kraken with the assistance of his flying horse Pegagus (who incidentally, was white in 1981) and a flying mechanical owl (more about him later). In the new version, Perseus wages war against the Kraken astride his steed Pegasus (now black) with magical sword in hand. Nonetheless, it’s non-stop action and suspense as the Kraken edges closer to killing the sacrificial Andromeda. At this point it would be unconscionable to reveal the film’s ending, but rest assured the Kraken is finally dispatched! Trivia – Earlier in the film, when Perseus and his soldiers are picking out shields, he pulls a mechanical owl off the shelf and is told “put that back!”. It’s a nice in-joke, referencing Harryhausen’s 1981 creation, Bubo, the mechanical owl, who was Perseus’ sidekick and comic relief in that earlier film. CLASH OF THE TITANS is a sword-and-sandals film filled with lots of swashbuckling action, sword fights and monster battles. Very entertaining. The fight with Medusa, the gorgon …Caution contains spoilers !! Rated PG-13 – fantasy action violence, some frightening images & brief sensuality. ….an amalgam of lighting, music and sound effects create a visual symphony of terror! Born in Rome, Italy on September 7, 1940, director Dario Argento grew up in a close knit household where family members told folk tales by Hans Christian Andersen, Edgar Allan Poe and the Brothers Grimm. Elements of these frightening bedtime stories would later become fodder for his horror films. With SUSPIRIA (1977), Argento reaches the acme of his creative works. Combining his stylized use of color, innovative sounds and rapid cutting, SUSPIRIA would go on to become one of the touchstone horror films of the 1970’s. Emphasizing mood, lighting and color, Argento is able to create a nightmarish world filled with angst and duplicitous characters. As the film opens, American teen Suzy Bannion (Jessica Harper) is arriving in Germany to join a ballet academy. It’s here that we’re treated to a host of Argento’s techniques. Suzy arrives at the boarding school late at night, amidst a driving rain storm. Vivid blue lighting emphasizes the rain drenched, deserted streets around the ballet school while the frenetic music of Goblin punctuates the soundtrack. Greeted by the dour school headmistress, Suzy is told “…we don’t teach you to dance here…we presume our students know how to do that!”. Of course it’s not long before, one by one, strange, grisly murders start occurring. Argento punctuates his well crafted, yet repellant, murder scenes with bright poster colored lighting and the heart pounding percussion music of Goblin. One of the most chilling murders involves a character, who, while running from The Killer, stumbles into a room filled with coils and coils of sharp razor wire (the type they run around prison walls). The visual experience is so captivating (and disturbing) that we have little time to consider why someone would store miles of razor wire in a room at a ballet academy. Rather, we just bask in the terror of this contrived situation, empathizing with the character, who is trapped like a fly in a spider’s web. Another gripping sequence involves a blind man and his Seeing Eye dog, alone at night in a deserted city center square. His dog barks at something (or someone) unseen, while all around him stark shadows give sinister life to the walls of the buildings. Wonderful cutting and relentless music combine with haunting “sighs” and “whispers” to make this a compelling scene. SUSPIRIA earned an R rating when it was released in the U.S. in 1977, and there’s lots of grisly violence, including the use of sharp knives, broken glass and other items that will make your skin crawl. Argento directs these scenes with flair, as an artist paints his canvas. The colors, the framing and the music lift this film from its roots as a mundane horror film into the realm of something much more special. Throughout SUSPIRIA, the action and mood is supported by the frenetic and haunting music of Goblin, an Italian progressive rock band best known for their work on many Argento soundtracks. Creepy “sighs”, “whispers” and other unsettling sounds permeate the soundtrack adding to the feeling of uneasiness. The set design on SUSPIRIA compliments the mood of the film. Many scenes are decorated with vivid, velvety red walls and flowing sanguine drapes. Filmed in widescreen, you’ll want to view SUSPIRIA in DVD letterbox format. Directors usually have trouble composing for the wide 1:2.35 ratio, but Argento handless it flawlessly. Slow camera movements down long, bright red, narrow hallways, add to the unusual claustrophobic feeling that this widescreen film is able to achieve. Characters are carefully framed, benefitting their onscreen movements. Arms gracefully stretch the width of the screen, and action is well contained during the murder scenes. Of special note is the swimming pool sequence, which reminds us of a similar scene in Lewton’s CAT PEOPLE (1942). The camera floats in front of the two girls, carefully following them as they swim around the darkly lit indoor pool. The camera movements alone would make for a very scary sequence, but the amalgam of lighting, music and sound effects create a visual symphony of terror. At the end of the film, we’re never really sure if the events really happened, or if they were part of Suzy Bannion’s dreams. It’s a moot point because this movie succeeds not as a story, but as a series of vivid, well crafted images….images that you’ll revisit in your nightmares! A modernistic classic, SUSPIRIA is available on DVD and should be viewed by all aficionados of the horror-gore genre. 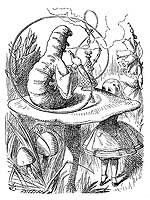 Alice in Wonderland has been in my consciousness since my earliest encounters with the Lewis Carroll stories. Their accompanying John Tenniel illustrations both fascinated and troubled me. The 1952 Viewmaster version, and the 1951 Disney Animated film collaborated to produce images in my mind that would become the fodder of nightmares. 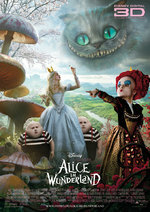 Now Tim Burton brings “Alice in Wonderland” to the theater screen. However, this time the nightmarish world of Wonderland is skillfully crafted and realized by experts who helped create the world of “Avatar”. Alice, now a teenager, is starting to feel the pressures of grown up life. She’s able to escape reality when she follows a mysteriously dressed rabbit to his burrow. As she falls down down the rabbit hole there’s a wonderful transition between the real world above and the fantasy world that awaits below. Sampling both the “drink me” bottle and the “eat me” cake, Alice gets to change sizes several times, and to our delight it’s all handled quite realistically. In a scene not unlike that in the “Wizard of Oz”, Alice opens the tiny door to enter the fantastic world of Wonderland. Here we get to see the lush detailing and conceptualization of this fantasy world and it’s bizarre inhabitants. The characters she meets are wonderful and highly detailed. They’ve all met Alice before, but she’s unable to remember the encounter. The Blue Caterpillar (voiced by Alan Rickman) is suitably mysterious, puffing continually on a hookah and the Cheshire Cat (voiced by Stephen Fry) is both creepy and vaporous. Special CGI effects give nightmarish qualities to the characters. Johnny Depp’s large eyes and the Red Queen’s bulbous head are but a few of the graphic treats that the movie holds in store. The highly detailed army of marching cards is entirely menacing and certainly much more convincing than the paper thin Queen’s guards that the 1951 film offered. Johnny Depp, as the Mad Hatter, brings in a great performance and as usual he melds himself to the role. At times I found the Mad Hatter to be almost a bit too sane, unlike the over-the-top 1951 Hatter. Depp gives a touching performance as a tormented soul who quickly forms a strong bond with Alice. Anne Hathaway offers a somewhat pedestrian performance as the mostly inneffectual White Queen. 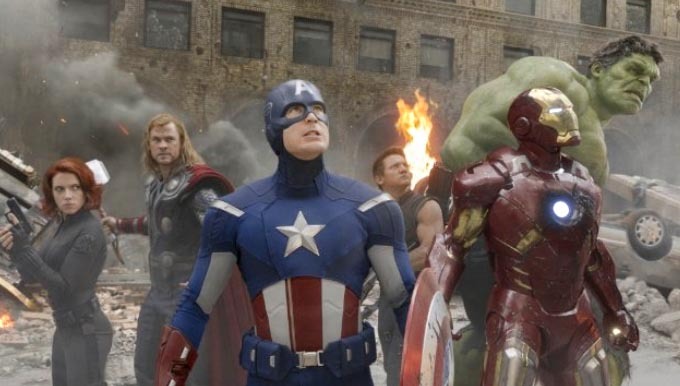 The final battle sequence reminds us of the recent “Chronicles of Narnia” (2005) in which all the characters in the film are rounded up for one last melee. Whether or not Alice is supposed to remind us of Joan of Arc is inconsequential. Her glistening armor is a wonderful touch of costuming, and the sword fight with the Jabberwocky (voiced by Christopher Lee) should satisfy most action fans. Please be forewarned that despite it’s PG rating, this is not a film for those under 13. There’s several disturbing scenes such as floating decapitated heads in the Red Queen’s moat, eye piercings and a decapitation during the final battle scene. Tim Burton’s vision brings this timeless story to life on the screen. A recommended film, both for it’s wonderful special effects and a new take on a classic story.